This topic provides user-interface (UI) guidelines for optionally using the Microsoft brand signature in a Live Search application on a Windows Embedded NavReady powered device or in print material. The Microsoft corporate logo can be used to identify Microsoft Corporation, or Microsoft products or services only in conjunction with the guidelines in this topic. Any usage that is outside the following guidelines is strictly prohibited. The Microsoft logo cannot be displayed as a primary or prominent branding feature on any non-Microsoft materials. Companies that use the Microsoft logo must display their own logo in the primary and more-prominent branding position. Do not combine your company logo, business name, product name, or other branding together with the Microsoft logo. Non-Microsoft materials should not be designed to mimic any Microsoft advertising, product packaging, or Web site design. The Microsoft logo cannot be used in any manner that would imply that any non-Microsoft goods, services, or Web sites are sponsored by, endorsed by, or affiliated with Microsoft. The Microsoft logo cannot be used in a manner that would disparage Microsoft Corporation or its products or services. The Microsoft logo must be used as provided by Microsoft Corporation without any changes. This includes but is not limited to changes in the color or design, or removal or any words, artwork, or trademark symbols. The Microsoft logo cannot be imitated, or used as a design feature on any materials. You can use only approved Microsoft logo artwork. 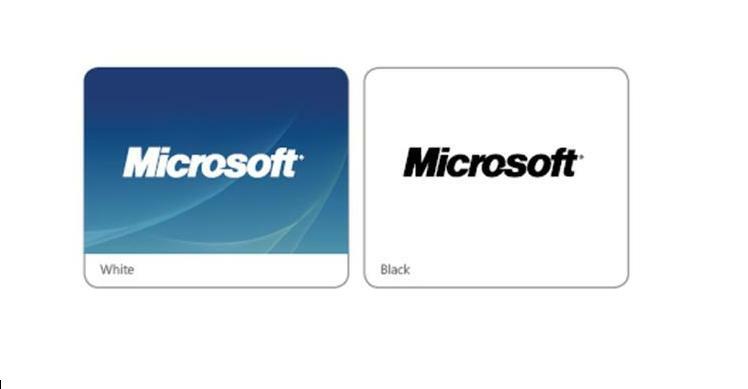 The Microsoft logo can only appear in black letters, or reversed to white letters. The logo can never be displayed translucent over a background, displayed using multiple color dimensions, or displayed using multiple colors for the letters in the logo. The Microsoft logo must always be accompanied by the registered trademark symbol (®). The Microsoft logo must stand alone and cannot be combined with any other object. This includes but is not limited to other logos, words, graphics, photos, slogans, numbers, design features, or symbols. The logo must never be used to represent the word "Microsoft" in text, such as in a headline, product-name logotype, or copy content in printed materials. The logo must not be incorporated or used in any manner as part of, or near to, another company's name, domain name, product or service name, logo, registered trademarks, design, slogan, or other trademarks. The logo must never appear with any other symbol or icon (except the registered trademark symbol); contained in a box, or other shape; or combined with any other name, logo, or icon to create a co-branded logo. The attribution clause "Microsoft is a registered trademark of Microsoft Corporation" must accompany use of the Microsoft logo. Third parties must never use, imitate, or play off the Microsoft corporate tagline "Where do you want to go today?®". This tagline is reserved for exclusive use by Microsoft Corporation. To correctly position the Microsoft logo, a minimum clearance between the logo and other UI elements must be maintained. The cap height of the letter M in the Microsoft logo indicates the measurement of minimum clearance between the logo and other elements on all sides of the logo. 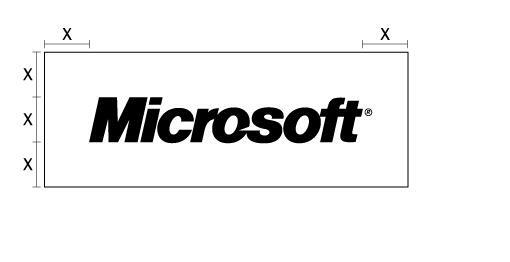 The Microsoft logo must always have a width of at least ¾ inches, 2 centimeters, or 60 pixels. The Microsoft logo must only appear in a horizontal position. The Microsoft logo should appear in white letters on dark backgrounds, and it should appear in black letters on light backgrounds.